The Manhattan Project, formally constituted in August 1942, was the code name for the federally funded research program to develop the atomic bomb. Fearing potential weapons applications of atomic research underway in Nazi Germany, President Franklin D. Roosevelt, in October 1939, authorized study on the feasibility of atomic weapons. 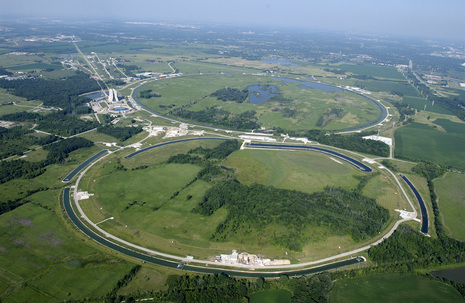 Much of the theoretical research for the Manhattan Project was conducted at the Metallurgical Laboratory (Met Lab) at the University of Chicago, and at an affiliated site in the Western suburbs which would become the Argonne National Laboratory. The Manhattan Project was the project to develop the first nuclear weapon during World War II; involving the United States, the United Kingdom, and Canada. Formally designated as the Manhattan Engineer District (MED), it refers specifically to the period of the project from 1942–1946 under the control of the U.S. Army Corps of Engineers, under the administration of General Leslie R. Groves. The scientific research was directed by American physicist J. Robert Oppenheimer. The project's roots lay in scientists' fears since the 1930s that Nazi Germany was also investigating nuclear weapons of its own. Born out of a small research program in 1939, the Manhattan Project eventually employed more than 130,000 people and cost nearly $2 billion USD ($24 billion in 2008 dollars based on CPI). It resulted in the creation of multiple production and research sites that operated in secret. 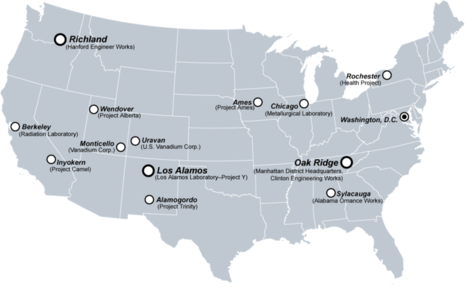 Though it involved over thirty different research and production sites, the Manhattan Project was largely carried out at three secret scientific cities that were established by power of eminent domain: Los Alamos, New Mexico; Oak Ridge, Tennessee; and Richland, Washington. The Tennessee site was chosen because of the vast quantities of cheap hydroelectric power already available there (due to the Tennessee Valley Authority) necessary to produce uranium-235 in giant ion separation magnets. 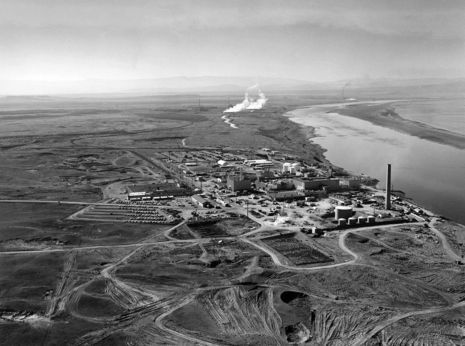 The Hanford Site near Richland, Washington, was chosen for its location near the Columbia River, a river that could supply water to cool the reactors which would produce the plutonium. All the sites were suitably far from coastlines and therefore less vulnerable to possible enemy attack from Germany or Japan. The Los Alamos National Laboratory was built on a mesa that previously hosted the Los Alamos Ranch School, a private school for teenage boys. The site was chosen primarily for its remoteness. Oppenheimer had known of it from his horse-riding near his ranch in New Mexico, and he showed it as a possible site to the government representatives, who promptly bought it for $440,000. In addition to being the main "think-tank", Los Alamos was responsible for final assembly of the bombs, mainly from materials and components produced by other sites. Manufacturing at Los Alamos included casings, explosive lenses, and fabrication of fissile materials into bomb cores. Oak Ridge facilities covered more than 60,000 acres (243 km²) of several former farm communities in the Tennessee Valley area. Some Tennessee families were given two weeks' notice to vacate family farms that had been their homes for generations. So secret was the site during World War II that the state governor was unaware that Oak Ridge (which was to become the fifth largest city in the state) was being built. At one point Oak Ridge plants were consuming 1/6th of the electrical power produced in the U.S., more than New York City. Oak Ridge mainly produced uranium-235. The Hanford Site, which grew to almost 1,000 square miles (2,600 km²), took over irrigated farm land, fruit orchards, a railroad, and two farming communities, Hanford and White Bluffs, in a sparsely populated area adjacent to the Columbia River. Hanford hosted nuclear reactors cooled by the river and was the plutonium production center. The existence of these sites and the secret cities of Los Alamos, Oak Ridge, and Richland were not made public until the announcement of the Hiroshima explosion, and the sites remained secret until after the end of WWII. The project originally was headquartered at 270 Broadway in Manhattan. Other offices were scattered throughout the city, including the New York Friars' Club building. The Broadway headquarters lasted little more than a year before it was moved in 1943, although many of the other offices in Manhattan remained.